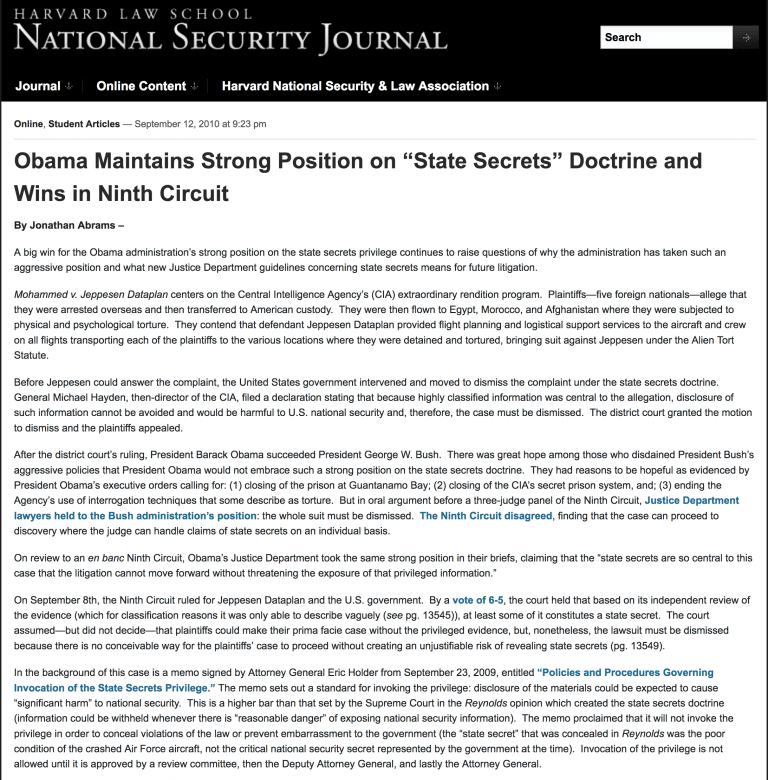 The state secrets privilege is an evidentiary rule created by United States legal precedent. Application of the privilege results in exclusion of evidence from a legal case based solely on affidavits submitted by the government stating that court proceedings might disclose sensitive information which might endanger national security. United States v. Reynolds, which involved military secrets, was the first case that saw formal recognition of the privilege. You can read the full background and history of this ‘rule’ on wikipedia if you would like a more comprehensive understanding of it. 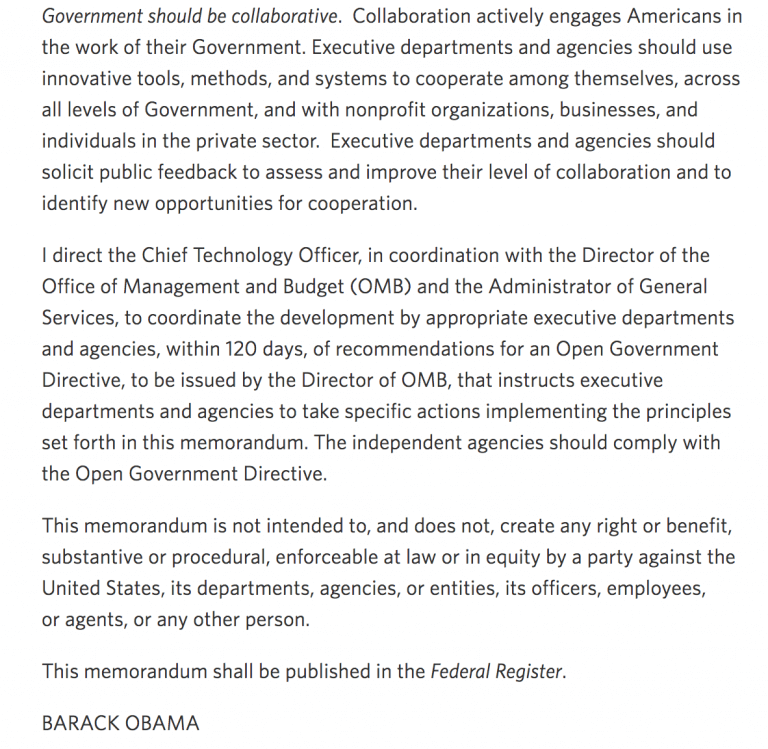 The Obama administration’s use of this rule was rather interesting when taking into consideration all of their actions promoting transparency to earn the trust of the public. 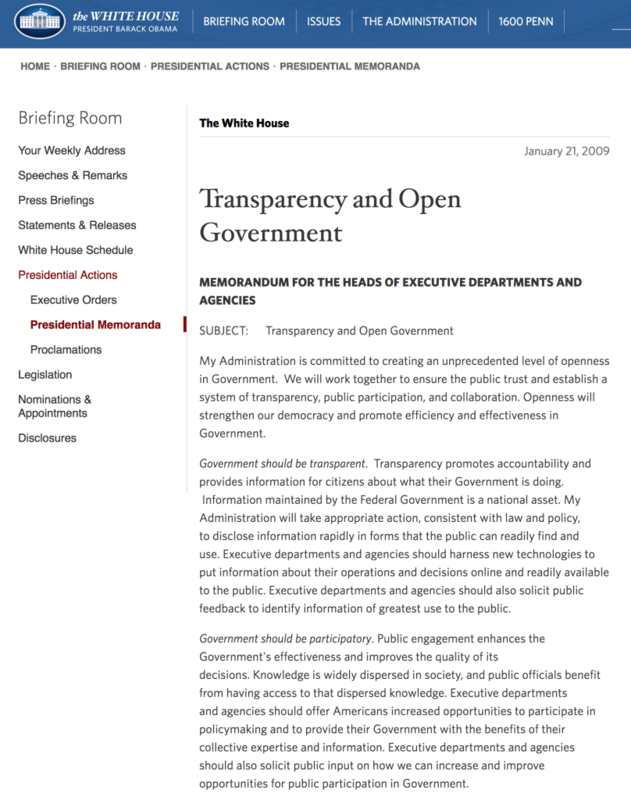 Barack Obama set the stage on the first of the year in 2009 with an executive memorandum about Transparency and Open Government. 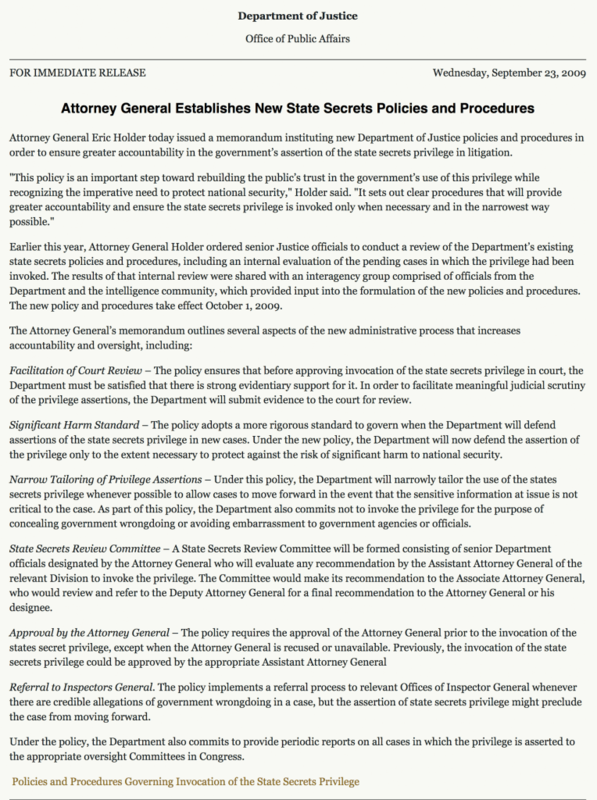 Later that year, on September 23, 2009, Attorney General Eric Holder established NEW state secrets and policies procedures to rebuild the public’s trust in government’s use of this privilege. 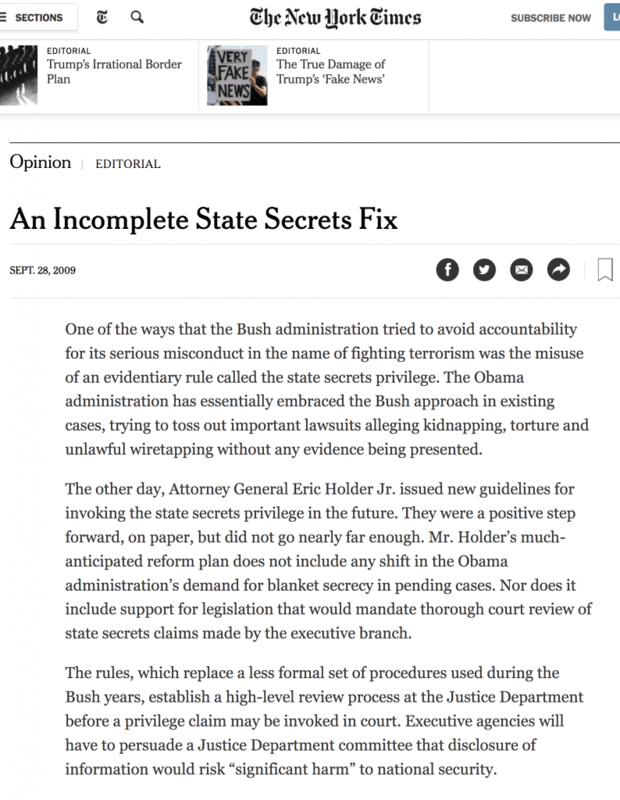 Apparently, the New York Times felt it was “An Incomplete State Secrets Fix”. 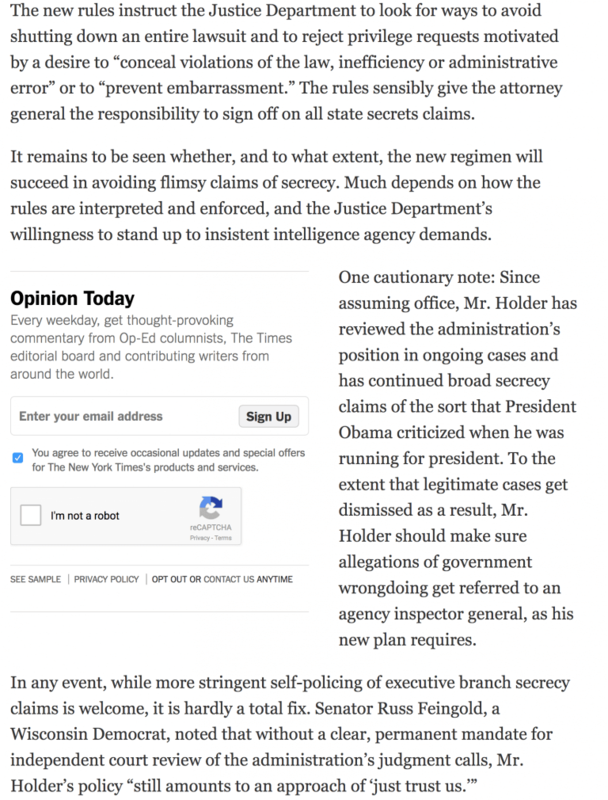 Ironically, less than one month later, a statement was made by Attorney General Eric Holder on Assertion of the State Secrets Privilege in Shubert v. Obama. A curious side note: 6 years after this document was released, it would appear that it was updated. Shubert v. Obama was filed in 2006 during the Bush administration and was carried over to the Obama administration. It was the longest running case against the government seeking to stop domestic spying. In 2015, 9 Years later, a partial summary judgment was granted to the Government Defendants. Shubert v. Obama. 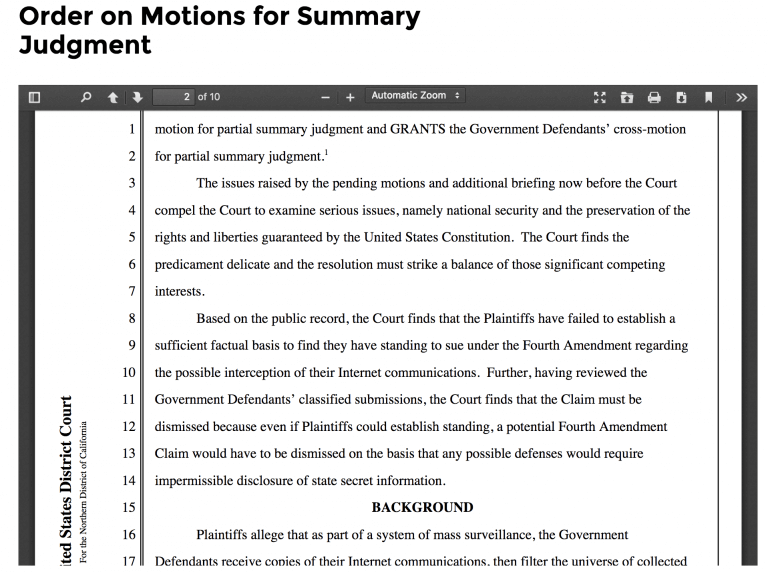 Order on motions for summary judgment. 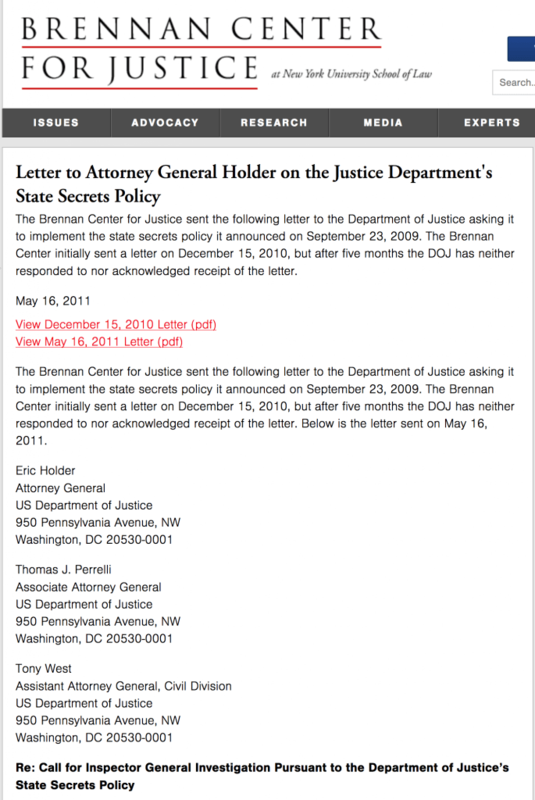 On December 15, 2010, The Brennan Center for Justice sent a letter to Attorney General Eric Holder and the Justice Dept asking them to implement the state secrets policy it announced on Sept. 23, 2009. They sent a second letter on May 16, 2011, and again received no response. This next case get’s really interesting. 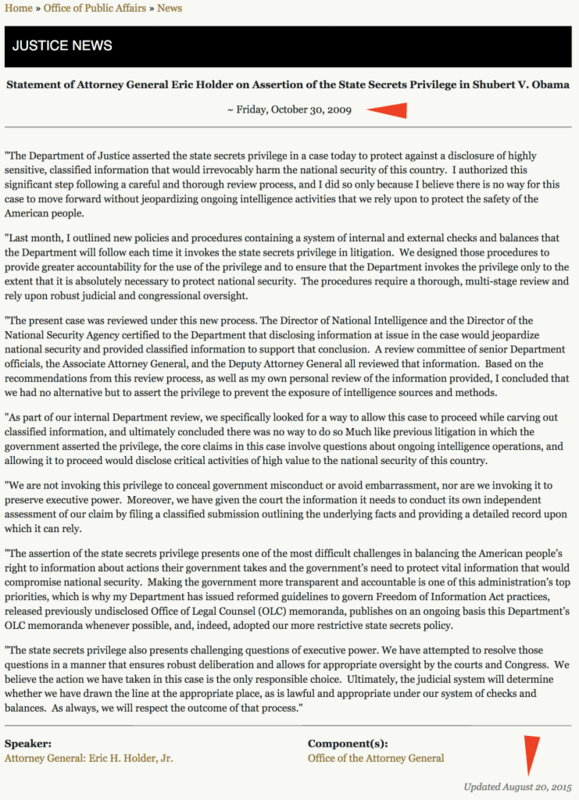 On July 19, 2013, in an unusual move, the U.S. Department of Justice filed a motion to make a private lawsuit disappear. 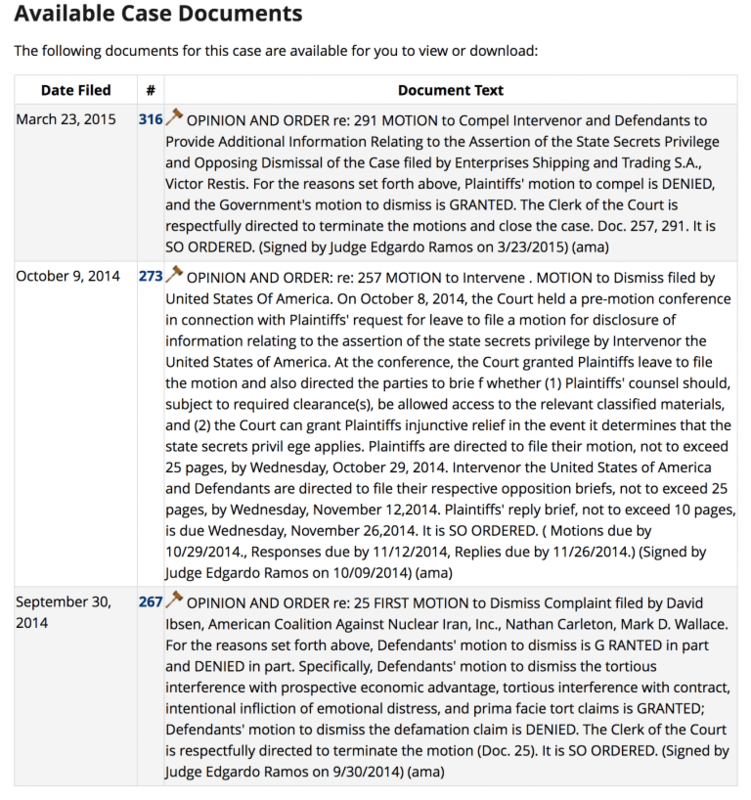 While the U.S. Government is not a party to this defamation lawsuit (Victor Restis et al. v. American Coalition Against Nuclear Iran, Inc.) Attorney General Eric Holder is concerned that the discovery might jeopardize national security. The prospect of a nuclear-armed Iran should concern every American and be unacceptable to the community of nations. Since 1979, the Iranian regime has consistently threatened the U.S. and it allies while undermining regional peace and stability. Iran continues to illegally procure nuclear equipment even after the JCPOA. Iran’s development of nuclear weapons would further undermine Middle East stability and could provoke a regional nuclear arms race. In short, the prospect of a nuclear-armed Iran is a danger to world peace. I can’t help but find this rather coincidental that it was formed during the Bush II era and Jeb Bush happens to be on the advisory board. I won’t go into the Bush family in this particular article, so I will leave it at that. However, this continued straight on through the Obama administration and that first objective listed above is rather disturbing given what we now know about the U.S. arming Iran, 1.7 billion to Iran, and the Uranium investigations still looming. Now that we have a basis for UANI, who is Victor Restis, the man suing UANI for defamation? According to his biography on his website, Victor Restis (The Restis Group) was born in Kinshasa, Congo. He began his career in the family’s Shipping Company, Enterprises Shipping and Trading S.A. (EST), where he was a key member of the Management team before becoming the president of EST at the age of 36. He led the evolution of Enterprises Shipping and Trading from medium-sized Shipping Company to a modern, diversified and one of the world’s largest privately owned fleets having reached more the 120 vessels recently. In the last decade, he led the group’s transformation from a Shipping Company to a diverse multinational and multicultural international Business Group with eclectic investments in a broad range of sectors including banking and financial services, (owning at one stage three fully licensed Banks in Europe), media, aviation, telecommunications, ship building/repairing, energy, hotels and hospitality services, leisure and real estate. From 2011 till 2013, he served as an Ambassador of the Republic of San Marino. He currently serves as a director in various organizations worldwide, including Protection & Indemnity Clubs, ship-owners associations, classification societies and non-profit organizations. Neil Chenoweth of the Financial Review covered this story in great detail. Read the full article for the complete back-story – Paradise Papers: Glencore hid link to ghost shipping fleet during Iran scandal. “The documents reveal Glencore’s hidden links to the sanctions scandal, which unfolded as Western intelligence agencies worked in 2012 and 2013 to identify companies trading with Iran. The documents show that Glencore secretly funds and helps operate a “ghost fleet” of 167 bulk cargo ships through SwissMarine Corporation. (Victor Restis is the second largest shareholder). Glencore owns 47.1 per cent of SwissMarine’s voting stock but says that its three directors do not control the company, because Mr Restis, who has sold down to 23 per cent, also appoints three of SwissMarine’s nine directors. None of this would surface in 2012 when Glencore and Xstrata announced merger plans. In February 2001, Glencore had just begun paying kickbacks to the Iraqi government for oil shipments in a breach of the UN’s Oil For Food program, the 2005 Volcker report concluded (Glencore denied any knowledge that its agents paid up to $US25 million in kickbacks). It was also that month, on February 2 and February 28 in 2001, that two Iraqi oil shipments bound for the US were diverted to Singapore and Croatia, where Glencore stood to make up to $7 million in extra profit (Glencore denied any intention to breach UN Oil For Food rules). In November 2012, the shipping market buzzed with gossip that Dimitris Cambis, a Greek professor with no previous shipping experience, had just bought eight aging supertankers through a web of front companies for $US204 million. On February 27, 2013, Reuters journalist Jonathan Saul reported in London that “officials involved with sanctions” had shown him shipping documents which showed that Cambis’ tankers were being used to ship Iranian oil to China to beat US sanctions. In a report by Reuters, they stated that on March 13, 2013 the US Treasury blacklisted Cambris, 14 of his companies and his eight tankers for helping Iran avoid oil sanctions. UANI believed that “by at least mid-2010, Restis was conspiring with Cambris to devise a web of business entities and relationships to buy crude oil from Iran and sell it to Chinese buyers. 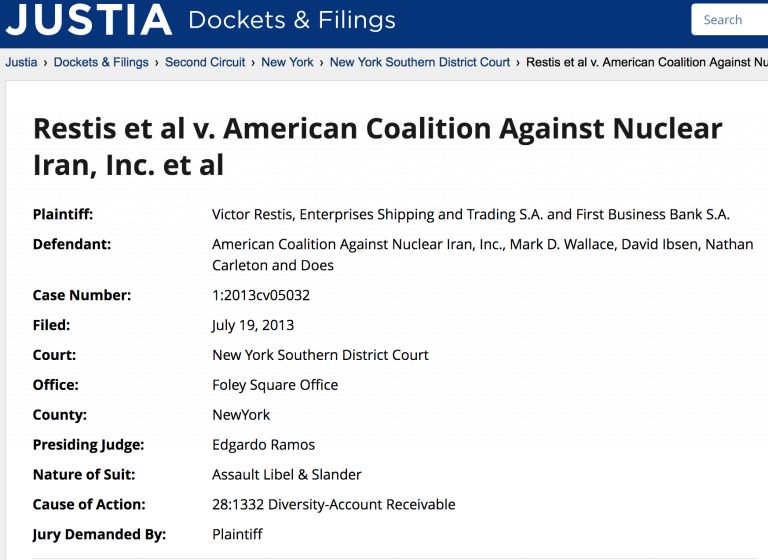 Then on May 13th, US lobby group, United Against Nuclear Iran (UANI), claimed it had been given documents that showed that Victor Restis, his shipping firm EST, and the failing Greek bank he controlled, FB Bank, had been part of the Iranian tanker scheme—which Restis vehemently denied. Later in court UANI would be more specific, claiming that “by at least mid-2010, Restis was conspiring with Cambris to devise a web of business entities and relationships to buy crude oil from Iran and sell it to Chinese buyers”. On July 19, 2013 Restis sued UANI for $2 billion in defamation damages, claiming its documents were forgeries. Four days later Restis himself was arrested by Greek police and charged with bank fraud, embezzlement and money laundering. Restis’ lawyers said the Iran sanctions claims had been devastating to Restis’ business, leading to the cancellation of a billion-dollar IPO on Nasdaq, while Restis’ shipping company, Enterprises Shipping and Trading SA had been put on a blacklist of companies said to trade with Iran – triggering difficulties with banks refusing to process its funds. Restis was released on bail on December 3 2013. He repaid the €15.8 million loans and three years later the charges against Restis, his mother Bella and 15 others were all dismissed by the Greek Supreme Court. The UANI defamation case was dismissed in March 2015 after the US Department of Justice intervened to claim that for UANI to disclose its sources and other details that Restis’ lawyers were demanding would threaten US national interests. 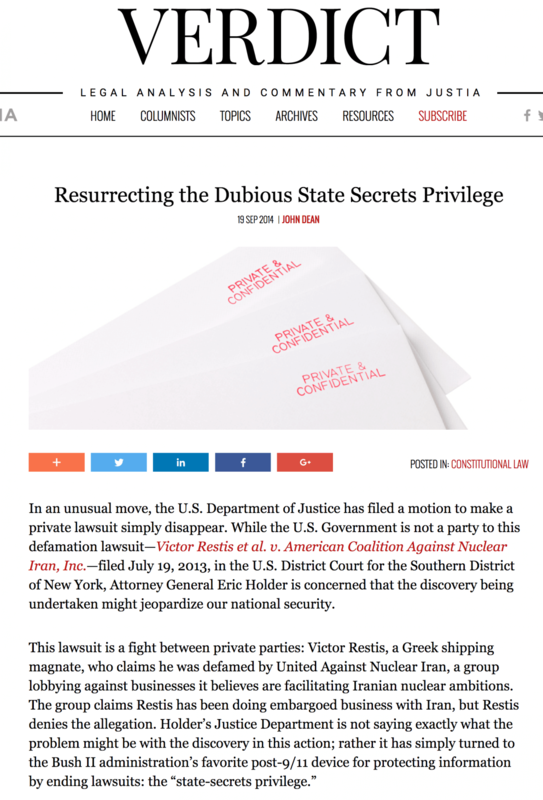 Based on Victor Restis’ sordid history (which involves a lot more than indicated here), one would think this case may have been more easily dismissed without the need for the government to invoke the State Secrets Privilege. What secrets were they so afraid of being revealed? This story certainly paints part of the picture, but you will have to use your digging skills and critical thinking to come to any final conclusions.